It felt a little strange heading south this year in unseasonably warm winter weather. My husband and I planned a surprise getaway as a combo christmas gift/family time week of “togetherness.” Opened on a 70 degree christmas day. Not quite the impact we wanted! We have been to Nevis before, to our beloved Nisbet Plantation. This made the trip really easy. We knew the drill. Unpacked with a rum punch in hand in no time. I made everyone choose one activity to do during the week. Mainly to get off campus because it is easy to get lazy and become one with your lounge chair. 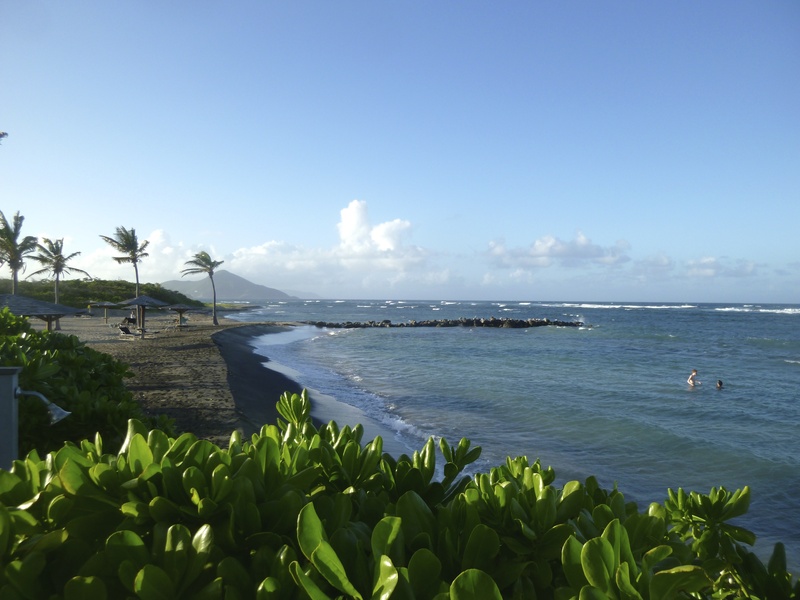 Here is what we chose: Bike around the island (19.5 miles), climb Nevis Peak (3,232 feet), dip in the 108 degree volcanic mineral baths and visit the birthplace of Alexander Hamilton. Guess which one I chose? There was also snorkeling, croquet on the Great House lawn, multiple card games of hearts, a little spa action and requisite rum punch tastings at our favorite places on the island. The house where Alexander Hamilton was born is charming. I got out of the Nevis Peak climb (bad knee, in need of a massage), but everyone else went. This is ideally how the weather should be for the hike. No clouds, the top of Nevis Peak exposed. Off to the restorative mineral baths for this crew. The water is HOT. The Bath Hotel, built in 1787. The Bath Hotel is the first official tourist hotel in the Caribbean, built to take advantage of the unique volcanic mineral baths and close proximity to downtown Charlestown. Patterson is quite dapper in his tux. The week flew, as you can imagine. The Nisbet crew anticipated our every need (Patterson, Angela, Roslyn, Violet, Dan, Caddy, Leonora, Derrick, Glendina). This wonderful group keeps us coming back! I love having the whole family together before everyone scatters. 2016 is going to be an AMAZING year. I will put you in my suitcase Lizanne! Still love this blog and you take the best photos!!! What a great trip! So important to take advantage of these times w your adorable girls!